Flashback Summer continues! 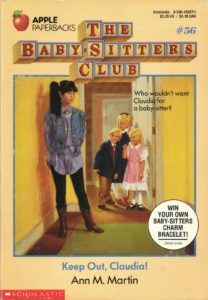 While Renata is off in the wilderness, settling into her Sadness Cave, Kait, our editor Becca, and our guest Jennifer said hello to their friends–the Baby-sitters Club! 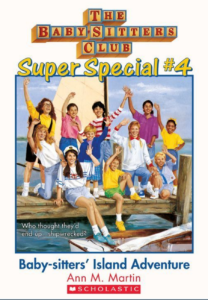 Kait, Becca, and Jen revisited the BSC franchise as a whole with Baby-sitters Club #56: Keep Out, Claudia!, Baby-sitters Club Super Special #4: Baby-sitters’ Island Adventure, and California Diaries: Ducky #3, thinking fondly back on the time when you could call one number and reach seven reliable baby-sitters, people just abandoned their children to The World’s Most Mature Thirteen Year Olds on the regular, and that theme song was constantly stuck in your head. Put on your oversized blue and pink tie dyed t-shirt, blue cowboy boots, pink and black checked leggings, side-ponytail, and one earring shaped like a musical note and one earring shaped like a guitar and join us for another stroll down memory lane in our Flashback Summer! Candy pairing: Kait says candy necklaces, Becca says Now and Laters, Jennifer says Fruit-by-theFoot. Coming up next: Goosebumps and Fear Street by RL Stine.